So it’s that time of year where we all obsess about our weight/body (okay, maybe not all of us), but some of us worry that we have to get “trim” for the coming months. Whether it be the beach, a holiday or even a BBQ the focus for fitness is on. Body image is a massive and controversial issue with many angered by how we are portrayed to have to look to be deemed okay for society. Okay, so maybe your weight shouldn’t be the biggest issue in your life and maybe being slim shouldn’t be set as the norm for society, as God makes us all in difference shapes and sizes. However, what I do know is that each and everyone one of us battles with some sort of self conscious demon throughout their lives and wants to make a change(mine would be to my thighs). 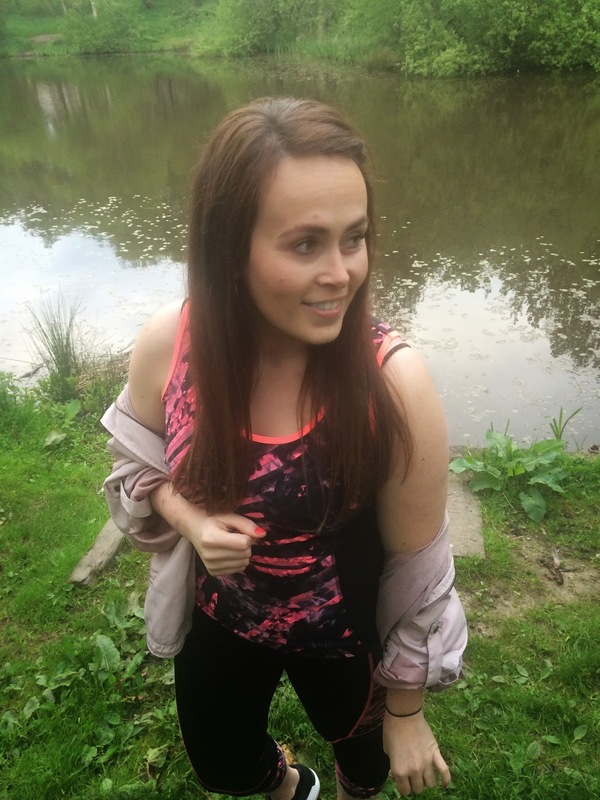 Although we go through times where we don’t feel our best, feel sluggish and down right URGH, this is where a little bit of good ol’ exercise comes into play, and this is what I aimed to do! With Slimming world slowly slippin’ through my fingers and cake entering my mouth a whole lot more, I realised that maybe for me to get my bum into shape it’d have to involve new gym gear(sad I know). You know, for real good inspiration and maybeeee I could resemble those put-together girls in the gym? Ha nah, Emma. Anyway, not too long ago I was emailing with Danielle from the lovely M&S PR team and she’d asked was I interested in trying out some gym wear to review for you lovely people! Er, it’s like she read my mind? Poppin’ on down to M&S I gathered the goods and went back home all fired up to test them. Slippin’ them onto the bed and awaiting for the morning I was determined to get to that gym and show myself that I could get back into the gym life. What I didn’t expect was 5:30am get up’s for the gym aint so great, so snoozin’ the alarm occurred. Although I was hittin’ that snooze button like there was no tomorrow, I do have a great and recent(in the past year) love of running. So this was the perfect opportunity to test these beauties out. With the Race for life nearing and my stamina at an all time low, the gym gear was set to not only be tried and tested, but to test me. C’mon the fitness! A few days later, slippin’ on the goods and noticing just how comfy these were, I threw on a lightweight jacket and headed for a run. By the way what most don’t know is that when I go to the gym or run…I resemble an actual homeless person. Therefore to wear somethin’ so fitted, comfy and well, fashionable threw me off. Ad I’d constantly wore baggy trousers with a rolled up hem(ironically M&S too), I’d never known that not only could I feel amazin’ in fitted gym wear but I surprisingly wasn’t worried about my troublesome thighs too. Marks’ gym wear was designed to be very fitted, comfy and breathe so that you never get overly hot. Long gone were the days of running wear being dowdy, ugly and ridiculously unflattering, as most retailers now understood that not only should it help it gettin’ you fit, but motivate you to actually put on that gym wear and hit that open road. From runnin’ in these beauties for around half an hour I concluded that not only did I feel confident and highly on trend, but that they were very fit for purpose. There’s no need to hit up Nike or any over priced retailer, as places like Marks’ offer the exact same value and quality for a fraction of the price. In all honesty I go to M&S a LOT, but to go for gym wear wouldn’t ever of crossed my mind and boy was I wrong. As not only can you wear it for the gym or a run, but bash it on out around the house too as we all know that’s a true exercise in itself! And if you don’t believe ten see for yourself and pop on down to M&S….or enter my competition below…wahay! 3. Await the draw which concludes at 9pm Tuesday 26th May 2015 to see if you’ve won! -Good Luck you lovely people! P.s for all those who just fancy a purchase hit up here for a re-direct to the great M&S fitness collection. Previous Post Aint no party like a Gin party. Next Post One Year On. They look great. Im currently trying to do the c25k running/jogging, but ive twisted my knee, so I am back to walking for the next 6-12 wks. The set looks great Emma – never thought of going to M&S for workout clothes before. You look fab in that workout gear! I actually didn't know that M&S did fitness clothing! At the moment, I really need some new gym clothes…and it might help with motivation! I enjoy running, swimming (although I'm not that great at it), and working out in the gym when I get some time (which is pretty rare).